With football season in full force, I am once again in the kitchen coming up with new game day treats. 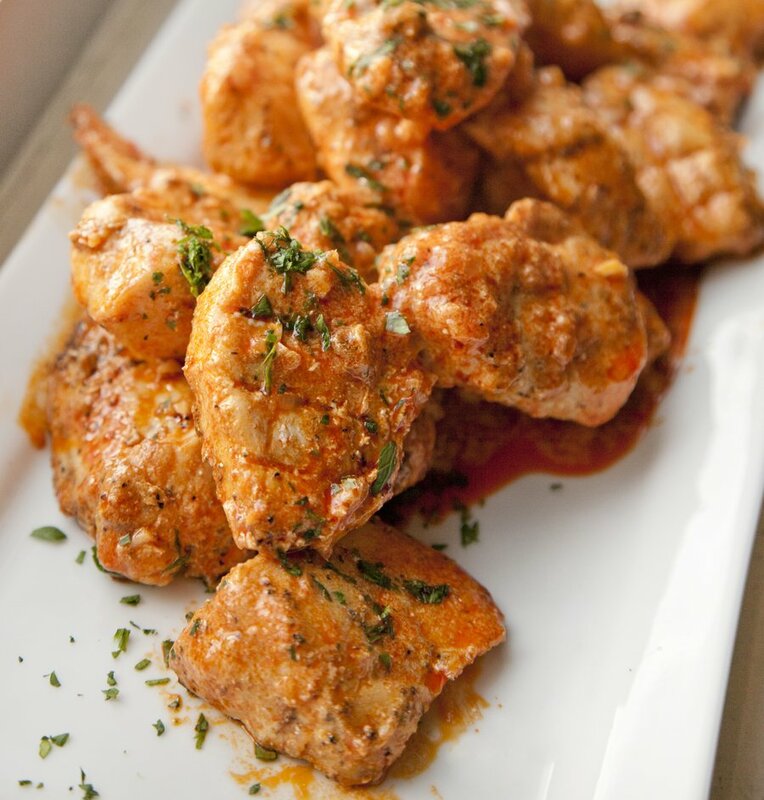 For me, hot wings are synonymous with Sunday Football….so I wanted to make a different version of your typical Buffalo Wing recipe. My husband has a severe hatred for any meat on a bone (I die a little inside every time I speak this detail aloud), so I am forced to leave my bone-in wings behind, to make boneless “poppers” as I call them. Feel free to repeat this recipe with wings instead of boneless chicken breasts…I’ll just cry alone, in a corner, in my boneless hell. Ok, I might be a little dramatic on this topic, but a girl needs her classic Football wings with ‘dem bones! 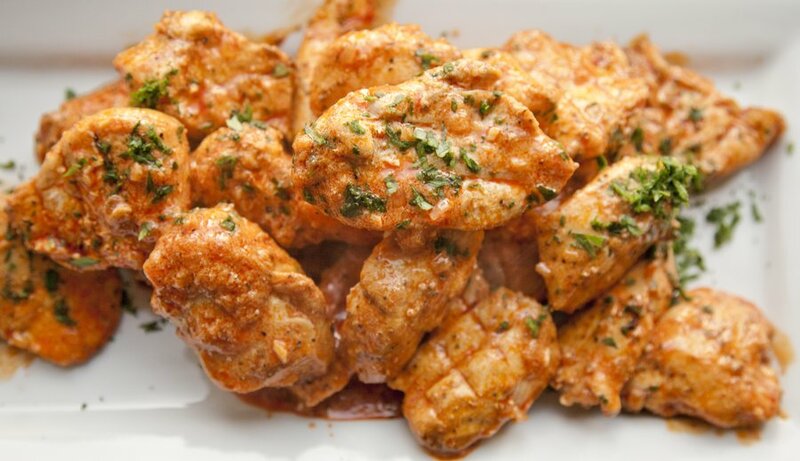 So this recipe is a fun cumin play on your typical buffalo wing – bursting with fresh spicy flavor (emphasis on the spicy) – this dish is not for the weak at heart. But since my Sunday’s are usually spent crying over a Giant’s loss anyway, I might as well shed some spicy cayenne tears as well. You can try this recipe out with any hot sauce that may be your favorite – to me, Hot Sauces and BBQ Sauces are like a cult regime, and once you’ve found your favorite, you tend to stick with them for life. My go-to Hot Sauce is Frank’s Red Hot (I also dabble in the Cholula pool from time to time, but don’t tell Frank). In a small bowl combine your garlic powder, cayenne, mustard powder, black pepper and cumin. Mix together. Reserve 1 tablespoon of this spice mixture for later usage. 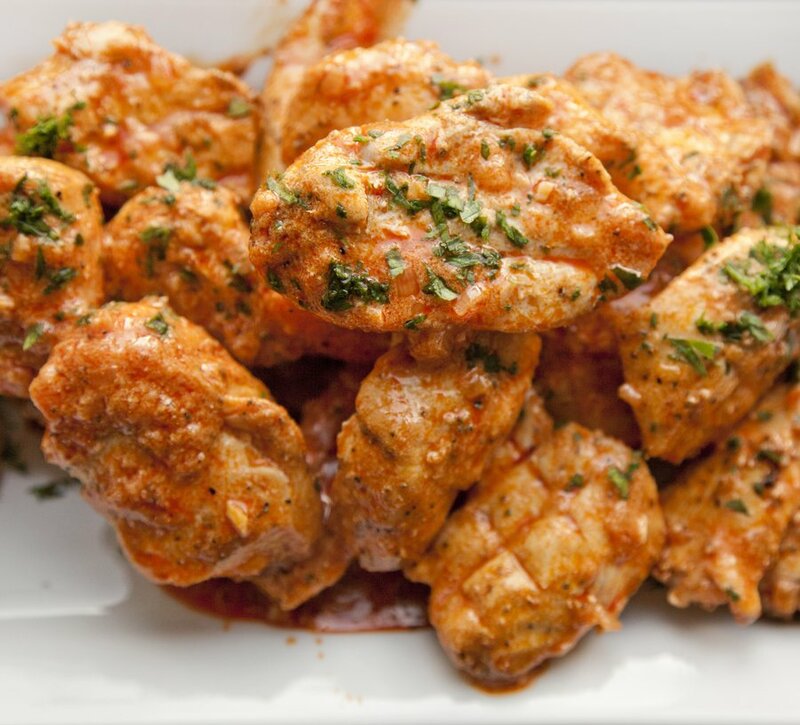 Cut up your boneless chicken breasts into 2" pieces (try and get all the pieces to be roughly the same thickness so it cooks evenly in the oven). 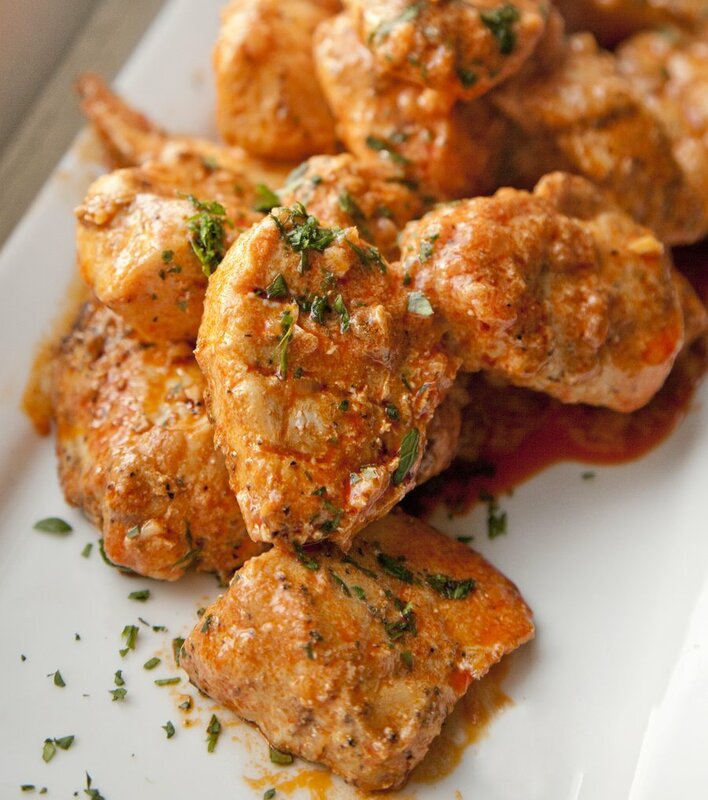 Toss the chicken in a bowl with the spice mixture from step 1. Place the chicken in the fridge for at least an hour. 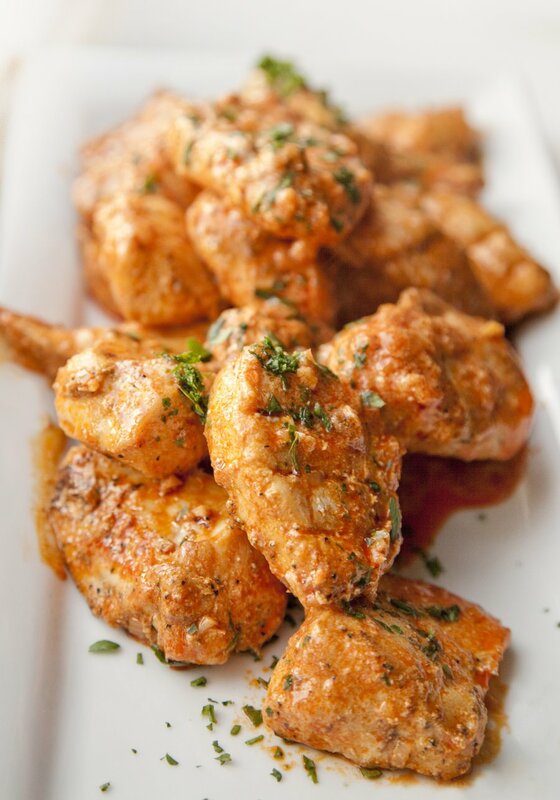 After the chicken has rested in the fridge preheat your oven to 375 degrees. 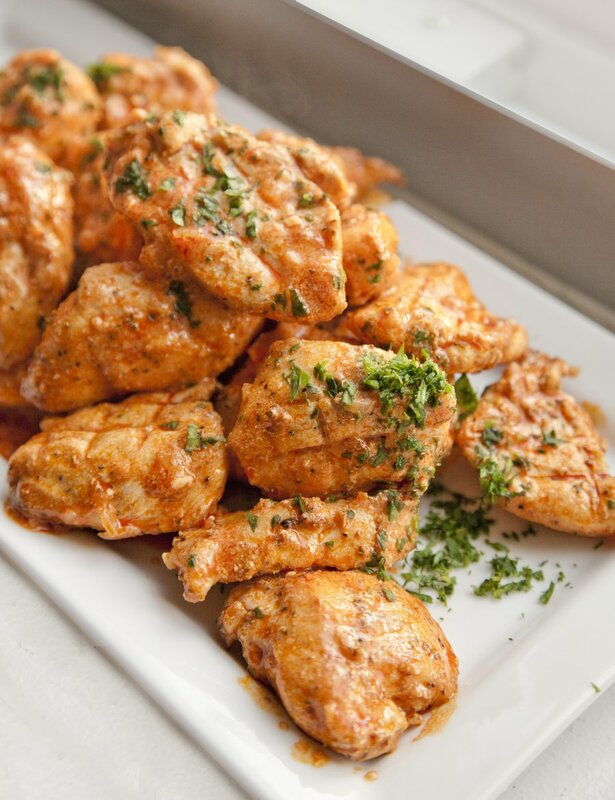 On a baking sheet, place a metal resting rack on top and put your chicken on top of the resting rack. Bake in the oven for about 15-20 minutes (or until cooked through. While the chicken is in the oven, heat up a small pot with 1 teaspoon of Olive Oil. Add in your shallot, garlic and ginger and cook for about 1-2 minutes. Add in your reserved 1 tablespoon of spice mixture from step 1 and cook another minute, stirring to prevent burning. Add in your butter, vinegar, lime juice and hot sauce and bring to a boil. Reduce to a simmer. Add in your yogurt and stir well to combine. Keep hot over a low flame until the chicken is done. 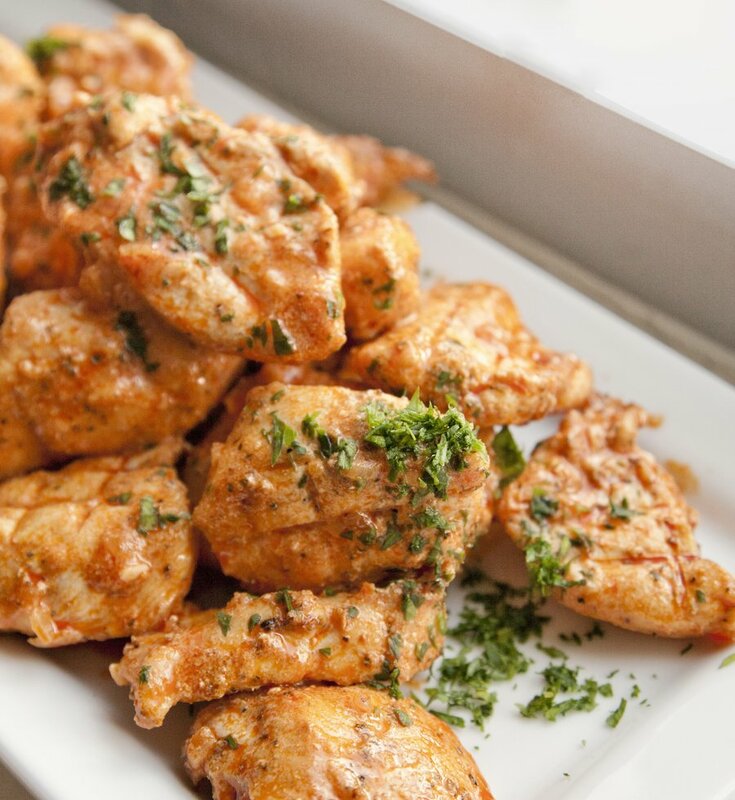 Once your chicken is done, place the chicken in a large bowl and pour the hot sauce on top, toss to coat the chicken completely. Serve hot.